To do this, many will consider SEO services. And they will receive a lot of different approaches. But which is best, and why? If these questions are on your mind, then this guide is for you. SEO services are offered in two ways: the right way and the wrong way. The right way is the high road. It’s where both the agency and client commit to making the website an outstanding and popular resource online. A resource that deserves to be ranked by search engines. The wrong way is the low road. It’s where the agency uses tricks and software systems to fool Google – for a while. Then everything comes tumbling down. If you are new to buying SEO, you need to know how to navigate your options. Connect with people who are actively searching for your products and services – great! At the precise moment they are most interested – great! In an always on, 24/7 way – great! And because the only person who can see a search result is someone who triggered it, search cuts-through. People who search want info from you. They have dropped everything else they could be doing to search. If your website can serve these people well and convert browsers into buyers, that’s a powerful competitive advantage. You do not need to do SEO to be in search results. You can be in search results, right now, for the keywords you choose by using Google’s advertising platform, AdWords. AdWords is exceptionally powerful and can deliver outstanding ROI and profit margin when correctly configured. Many marketers just use AdWords, not really caring about SEO, and have great success. Unlimited keyword targeting. AdWords ads use a cost-per-click model with an associated daily budget for clicks. If that budget for clicks exhausts, ads stop showing until the budget refreshes the next day. AdWords advertisers must therefore make careful decisions about the keywords they want to target and which ones they are willing to sacrifice by not targeting. SEO allows you target all the keywords you want, as much as you want. The potential with SEO is unlimited. Not time-bound. AdWords advertisers with a limited budget often have to settle for only showing ads part of the time to avoid their budget exhausting quickly, whether between certain hours of the day or for 1 in every 3, 5, 10 (etc.) searches. Organic search results, which are influenced by SEO, show all the time. For every click ad click on Google, there are 20 clicks to an organic result. More credible to people searching. Searchers understand the difference between an ad and the organic results. Because the organic results are selected by Google, they carry an implied endorsement effect of being the best result for the search. There is no user scepticism that “this is just an ad”. Builds in value over time and not easy to duplicate. Any of your competitors can create an AdWords account and start showing ads. Few competitors can do what it takes to succeed with SEO, which builds in value over time as the site ranks for more and more keywords. For these reasons, SEO is a competitive barrier of entry and multiplies the value of a business. Strong SEO ultimately provides the ability to generate new customers at a lower cost than competitors, at scale. Two clients Reef has provided SEO agency services for, Menulog and OrderIn, have successfully sold their businesses and their SEO visibility would have been of major appeal to the purchasers. Here’s an exaggerated but common scenario. Imagine you are talking to two SEO providers. The first provider says “SEO is complex, will require a lot of effort from you as the client and us as the agency, and will take time to show results.” The right way. The second provider says “Guaranteed rankings in 90 days or we work for free into perpetuity until you start ranking. You don’t need to do anything other than sign this contract. You can then sit back, relax and enjoy dominating the top of Google while your website skyrockets to the top of search results. You don’t need to do anything because we’ve developed a secret formula for SEO. Oh, and only whitehat techniques, of course”. The wrong way. People, innocently, fall for the wrong way all the time. The pitch is just too slick. You can’t blame them. But the fact is that the wrong way of doing SEO is so damn risky. Just a few months of a bad SEO company ‘working’ on your site can ruin its reputation with Google for years, banishing it to the backwaters of search results at great cost to repair. Why go through all this risk when AdWords is right there as an option? Some will say “AdWords is too expensive”. What I think that means is “AdWords traffic isn’t making a sufficient return because it’s not converting well enough.” If that’s the case, focus on fixing issues with traffic quality and conversion rate. Once that’s done, then do SEO (the right way). SEO services are typically delivered in ongoing engagements, where a team of people with different skill sets important to SEO helps the client understand what to do, why, how, and then gets it done. Both items are important, but the client education one is most often overlooked. A great agency takes clients on a learning journey with SEO. The agency is the guide, helping the client to understand and enjoy the SEO process. The savvier the client gets with SEO, the faster the agency will get sign-off on big ideas, the higher level the conversations will be, the easier it will be to get SEO workflow items processed and the more everyone will get done. The core of the engagement. What makes the numbers line up. What keeps ‘The Board’ happy. To get results with SEO, we need to talk, briefly, about how search engines work. Within these processes are ranking factors, which are the criteria search engines use to evaluate web pages. These ranking factors have been formulated over the past 20+ years, carefully revised and iterated to make results better for the person searching. There are excellent resources online for understanding SEO ranking factors, one by one. And if you’re an SEO professional, you’ve probably studied them. But the fact is that, as a client, you don’t need to know every ranking factor. You just need to know what search engines value in a quality web result – the intent of what these ranking factors measure – and you’ll be doing it automatically. Technical. Does the site work well? Content. Does the site have appropriate content matching what people are searching for? Authority. Is the site credible? Can search engines measure this credibility? User Engagement. Do people want to click-through and stay on this website? If you are working with an SEO agency, your need activity in each area. Miss an area and your results will suffer. For this reason, choose an agency offering a complete approach, and be wary of agencies who neglect a key area. If you would like more detail about the types of actions within each category, they follow. Because SEO requires multiple people working together, the SEO agency you work with should have a project management system in place for streamlining workflows and getting high-value work done. It is impossible for an SEO agency to do good work without working closely with the client. 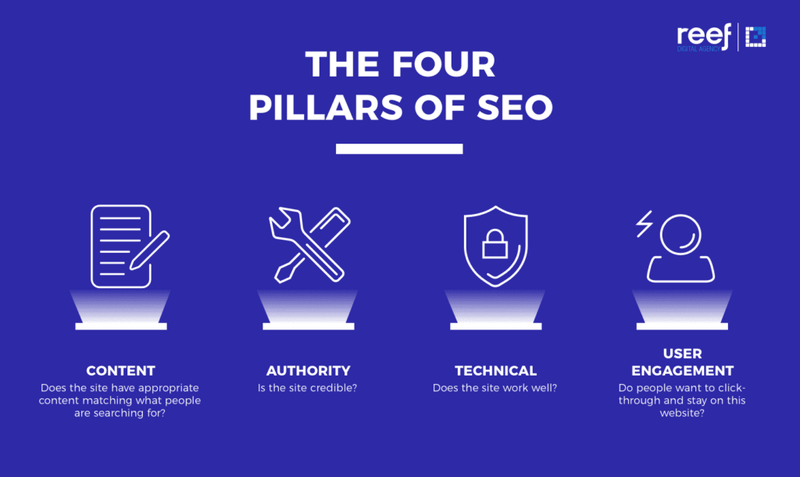 Let’s talk about each of the 4 SEO pillars in more detail. Can search engines, and users, easily discover and interpret all the pages you want indexed? Is the site error free? i.e. no broken links, broken pages (404s), or server problems? Fixing technical problems is foundational to SEO success. There’s little point doing other activities if the site isn’t working correctly, which is why technical items should be addressed as one of the first orders of business in an SEO engagement, then monitored on an ongoing basis. HTML coding mistakes. HTML code provides a structure where important elements of your website such as your headline, paragraphs, lists, etc. are labelled. For example, your headings should use the heading tag. Your paragraphs should use the paragraph tag. Your lists should use one of the list tags, and so on. If the labelling isn’t done correctly, the search engine can misunderstand the contents on your website. Making sure your website is correctly labelled makes it much easier for the search engine, improving the chances your website will be properly classified in the index. Something to be aware of is that page elements can look fine because they are styled correctly, but lack the proper labelling behind the scenes. Broken links and pages. Broken links and pages impact the search engine as well as visitors, so understanding what’s broken now, identifying the cause and creating a plan to fix makes for better SEO and user experience. Duplicate content. If you have a website that uses a content management system (CMS), sometimes you’ll find that the same content can appear on multiple URLs across the site. Search engines don’t know which version of the content is the right one to rank, and if there’s lots and lots of duplicate content, search engines can abandon their crawl of the site. Page speed items. Everyone loves a fast loading site, especially on mobile. Recommendations around compressing large images, tidying up large blocks of code, examining server speeds and browser caching all contribute to speeding up your site. Security issues. It’s becoming more and more important to upgrade to secure protocols, which is why you see a lot of sites moving from HTTP to HTTPS (the S stands for Secure). That aside, the internet is like the wild west sometimes and as such, we’ve found all sorts of exploits and problems on client websites, which impacts the trustworthiness of the site. Page descriptions. Search engines examine certain parts of your website to develop an understanding of what the page is about. Critically, this includes your Page Title, Meta Description and URL, all of which should follow established formats and include priority keywords. Sitemaps. Sitemaps list out all the URLs you want the search engine to crawl. Sometimes, these sitemaps aren’t up to date or are incomplete. Other times, they are missing entirely. Technical items should be prioritised by importance, then added into developer workflows. The SEO consultant should guide and assist the development team throughout. The SEO agency should also be able to draw a line between what’s really valuable to do and what’s not. The worst SEOs keep the dev team busy with low value items in the name of best practices, wasting time and money. People search to find answers, to find content. Every second, Google processes about 40,000 searches. That’s a lot of demand for content. Your website should have a content strategy to serve your users and offer new content for search engines to rank. The more substance your website has, the more ranking opportunity. Because of how important content is to modern SEO, many agencies hire people with backgrounds in journalism. Search engine algorithms collect this data during their crawl of the web, computing your authority on an ongoing basis. A site that’s been around for 10 years, owned by a major brand, has regularly been publishing about a topic, has links from all the most influential sites in the space and is regularly shared by opinion leaders, is going to have more authority than a brand new site, owned by John Smith, on a brand new domain, with one page of content, no incoming links and no social shares. This activity is often described as ‘Digital PR’. When done well, it should boost the brand, send new visitors via referral clicks and provide search engines with positive signals of authority. 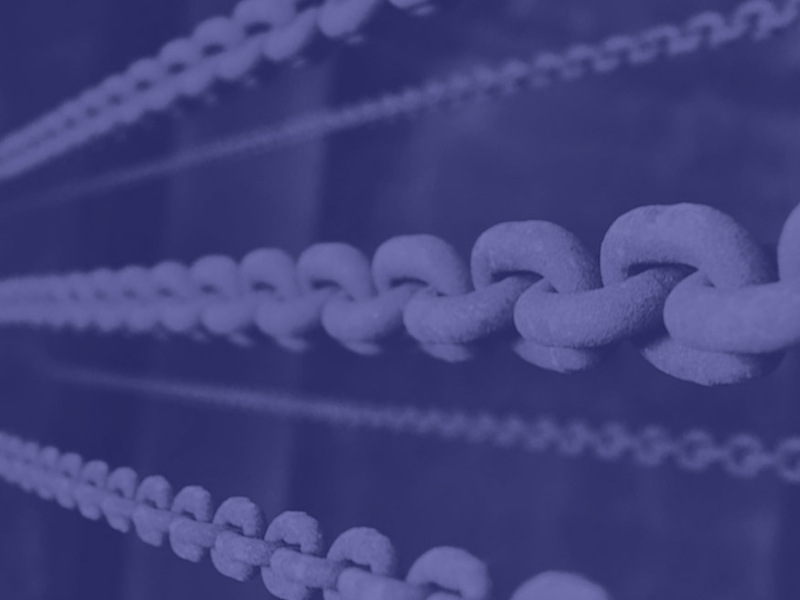 Link building is the strongest way to influence SEO rankings, so the SEO services provider you work with should have a process for earning high-quality new links online. Bring your offline relationships online. Talk to the people you already do business with and ask for a link. For example, give your accountant a testimonial they can place on their website, with the testimonial linking to you. Give the web something great that it doesn’t yet have. From new content to a tool to a cause, creating and promoting something of value to the web that people want will earn you links at scale. Get listed in trusted, popular directories. Make sure your Yellow Pages listings and other directories are up-to-date and accurate, which allow you to link to your website. Get involved with charities, not-for-profits, universities and so on, who often link to supporters. Find text mentions of your brand online and turn those mentions into links. Contribute an article to a popular publication in your space and ask to be credited with a link in the author bio box. Research where your competitors are getting links from to find opportunities for your business. Here are more link building ideas, and here too. An SEO provider who builds links from low-quality sites, using disingenuous tactics like link schemes, puts your site at risk of getting penalised. You should have full visibility on new links, which you can keep track of that yourself using Google Search Console. 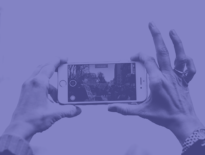 User Engagement describes how people interact with your site in search results, and how they interact with your site once they click-through. Click-through rate: are people more likely or less likely to click on your search result vs. competitors? If more likely, that’s a positive signal. If less likely, negative signal. First impression: when people click-through, do they stay on your site or do they immediately go back to search results? If they stay on your site, positive signal. If they go back, negative signal. Personalisation: is your site a good match based on the searcher’s location, previous searches, browsing history, and social connections? Search engines use this feedback to move listings up and down. Updating page titles and meta descriptions to better appeal to searchers. SEO requires a lot of input and time from the client. For a standard engagement, I would suggest 1 to 2 work days per month of client time will be required to work with the agency. If the client does not have this time available because they are too stretched as is, SEO is not a fit. Instead, it’s better to look at AdWords. There is no point selling SEO to a client who is not ready for the new responsibilities that come with it. SEO engagements with the highest price tags often cost the least. SEO engagements with the lowest price tags often cost the most. Let me explain. A client hires a highly competent SEO team. The price of the SEO engagement is $10k a month. After 6 months working together, the SEO team makes a massive gain in visibility that produces $20k per month of new profit for the client, ongoing. The agency is paying for itself and producing an extra $10k for the client. This is exactly what a good agency should do because ultimately, SEO is an investment. Compare this to a low price SEO vendor. The vendor does not charge enough to do legitimate work so must rely on blackhat trickery. The site gets penalised and the client suffers opportunity cost and a lengthy recovery. Low price, high cost. SEO engagements are typically delivered on a monthly retainer basis. Occasionally there are one-off deliverables, but the more common situation is a client wanting to work with an agency for an extended period of time. The reason for a monthly retainer is because organic search results generally require a pattern of activity over several months to start moving. With respect to your specific situation, the SEO agency should show you exactly how they have arrived at any pricing put forward. There’s a lot of ‘unknown unknowns’ here. Any projection is a guess, at best. To have multiple skill-sets across each pillar area, which is very rare to find in one person. Two or more people is the norm. The tools of the trade. Budget $500 to $1000 per month in SEO software subscriptions, and $10,000 a year for training. Management, coaching, a space in your office with a computer and two monitors, annual leave and other entitlements. This person will usually have a broader understanding of the marketing mix than a specialist would. As part of the team, this individual is a key player who greatly multiplies the productivity of external vendors. You may have gains sooner than 6 months, usually for less prominent (but nevertheless important) keywords. But to break into the higher volume terms is more difficult. Google is less willing to adjust those rankings without great cause. After 6 months of activity, SEO results tend to be much more ‘movable’. The site has developed a pattern of positive activity that sends all the right signals to search engines, and Google is ready to respond more quickly. It is during this time that the value of SEO work begins to magnify, i.e. These questions should reveal 95% of what you need to know. What is your methodology and process for delivering SEO to clients? Talk me through by month. Avoid any agency who wants to make things up as they go along, as it shows a lack of planning and will create confusion and slow down workflows. See what you get, in each pillar category. Find out if a particular category is missing. If so, why? What level of transparency do you provide? You want full transparency around what’s being done, by when, and by who. Can you show me examples of work? Have a look at the content the agency produces and the links they build for themselves and their clients. You can see the links pointing a website by signing up for a free trial with a tool like Moz Link Explorer. Can I speak with a client you’ve been working with for over a year? Consider asking about roadblocks, account manager changes, senior leadership involvement on the account, workflows, reporting frequency and quality, effort, and anything else. Will any of this work be done offshore? If so, what? See if you like the answer. I hope you found this SEO services guide helpful for sorting the wheat from the chaff. All the best with your SEO and agency selection process!